Patients with many or all of their teeth missing have to rely on partial or complete dentures for their tooth replacement solutions in Orleans. Removable partial dentures are sets of prosthetic teeth that are held in place with metal clasps that are strategically attached to remaining natural teeth. The prosthesis can be conveniently removed and reinserted by the patient, without any professional assistance. 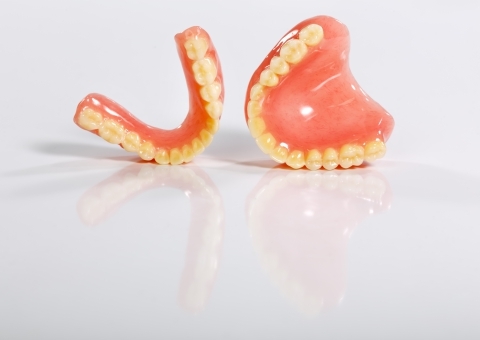 Removable complete dentures are full sets (full arches) of prosthetic teeth that are custom-made to fit, as closely and firmly as possible onto the patient’s jawbone (for support and stability). Patients can easily remove and reinsert their dentures for cleaning, overnight comfort, etc. A distinct and frequently mentioned disadvantage of both removable appliances is their less than perfect support and stability. This naturally negatively affects a person’s overall ability to bite and chew effectively. Poor fit can also mean some discomfort and oral hygiene issues. Last but not least, without the presence of dental roots, the jawbone eventually starts to recede (shrink) and becomes more fragile. Over time, the fit diminishes and the risk of fractures increases. With the introduction of dental implants came the “fixed” versions of all teeth replacement options. Crowns, bridges, and dentures can now be attached to artificial dental roots (implants) that are embedded in the jawbone and hold the restorations firmly and permanently in place. For more information please see the dental implants section of our website.